BlenderBottle ProStak Twist n' Lock Storage Jars Expansion Paks expand the capacity of the BlenderBottle ProStak system, making it easy to carry more proteins, powders, vitamins & pills, supplements and more. 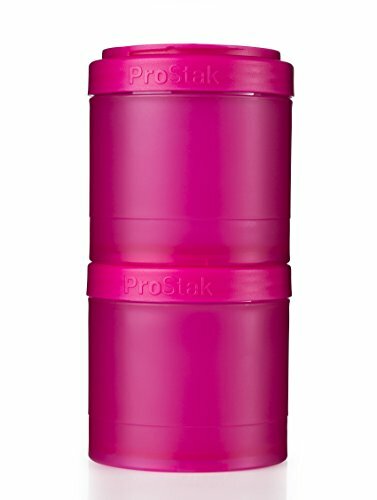 The ProStak’s unique interlocking jars have individual lids, so it’s possible to carry it all with or without the bottle. The 3-Pak features extra 100cc and 150cc jars, doubling the initial capacity of the ProStak system, while the massive 250cc jar offers ample room for even the largest protein, meal replacement, and on-the-go nutrition needs. The covert pill tray locks into any jar lid, allowing users to carry pills and powders in the same jar. The 2-Pak comes with 2 extra-large 250cc jars and the pill holder. BlenderBottle ProStak Twist n' Lock Storage Jars Expansion Paks are made from the same great mateials as all BlenderBottle products, are dishwasher safe, and BPA- and Phthalate-free.